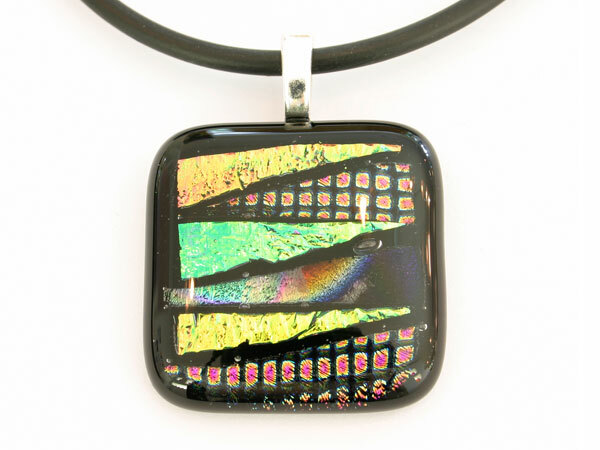 One-of-a-kind Dichroic Glass Pendant on 18″ black rubber cord with sterling silver latch. Please contact us if you prefer to buy the pendant without a rubber cord or if you would like a sterling silver chain. SKU: DicroicPmulti2. Categories: Jewellery, Pendants. This pendant has been individually made by hand. 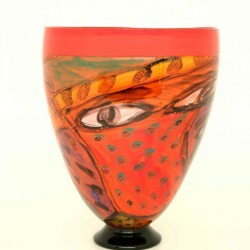 Several pieces of handmade glass are stacked and placed into a kiln and fused together at high temperatures as high as 815º C (1500º F). It is then allowed to cool slowly over a specified time, soaking at specified temperature ranges which are essential to the annealing process. This takes place normally for a period of 10-12 hours in 3 stages. 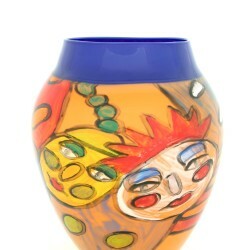 The exact combinations of glass, temperature and placement within the kiln create a different result each time. Tiny air bubbles may be trapped – frozen forever in the glass. 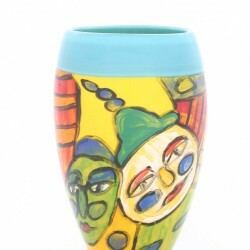 Each piece is unique in its final form and finish; therefore, no two pieces will ever be duplicated. This is what gives the glass jewellery its individual personality.